Following a big foodie extravaganza at the First Bites Bash last night, Chicago Restaurant Week is now underway. Starting today and running through February 9, Chicago Restaurant Week offers hungry diners prix fixe meals at some of the city's most beloved eateries. Over 300 restaurants are participating, so it's a chance to get a good deal on some of your favorite places - or even better, discover some new spots or take advantage of the prix fixe menu to visit a luxurious place that may otherwise be a little beyond your budget. There are 66 new participants this year, so even if you think you've hit every place on the list, you'll find something new to entice you. It's also a great way to preview some spots that you may want to make a Valentine's Day reservation for. 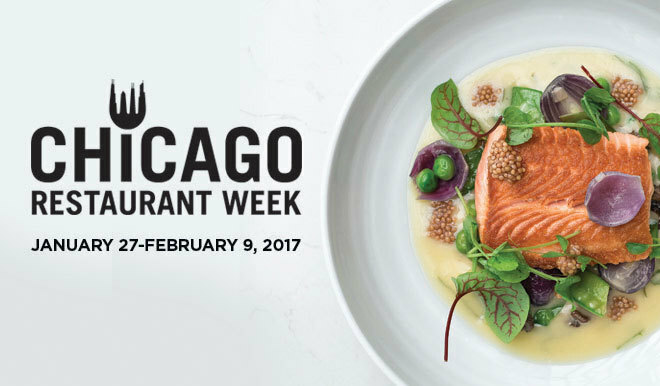 During the Chicago Restaurant Week promotion, participating restaurants will off specialized menus prices at $22 for lunch and $33 or $44 for dinner (excluding beverages, tax and gratuity.) Some feature up to four-courses with multiple options. For a full list of participating restaurants, visit ChooseChicago.com.